I'll be adding more as time goes by. Next one will be for a select few that gets one of their projects picked by our staff! Yes, seeing who liked your last project, or if someone answered your last comment is cool, but that's not what I find the most exciting about this. 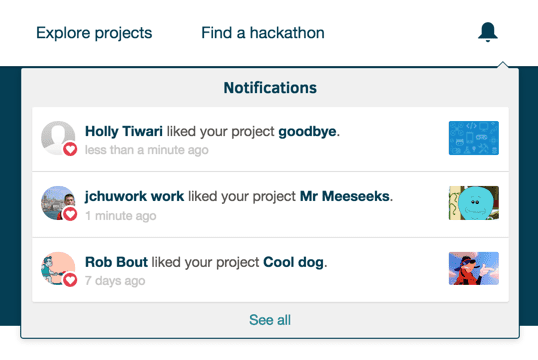 I think these notifications will shine during hackathons. 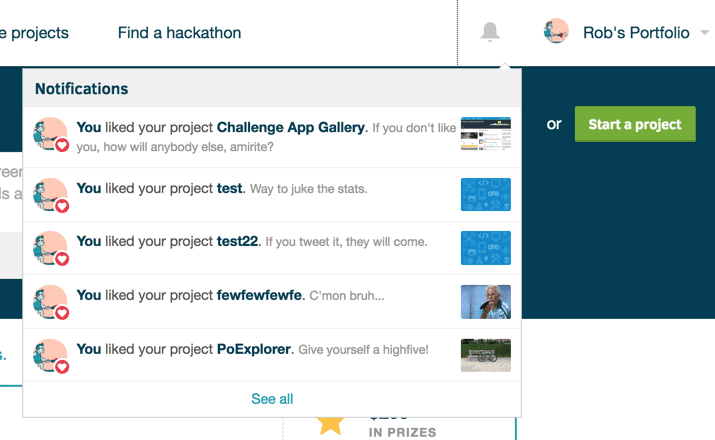 It will be a great way for hackers to follow what's going on during a hackathon, and provide an additional motivation to hang out on Devpost. The notification feed itself is built on top of Stream (getstream.io), same as our homepage feed. Stream actually supports notification feeds out of the box, which helps a lot. The rest of the work is getting the data we store on get stream in a nice format that can be used by the Marionette app to display the notifications. This is a work in progress, I'll post updates as I go. 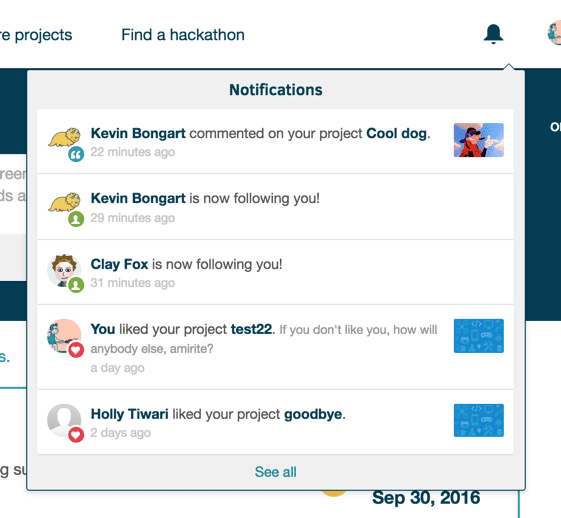 @nealrs posted a project allowing you to check out your notifications right from the OS top bar! Check out the project page on Devpost. The UI is far from finale, but it's looking better than the last Gif I posted. The notifications are strongly inspired from Tumblr's. The user avatars and software thumbnails are now displayed. Doing that made me thing about the performances of this page, which could be quite bad. 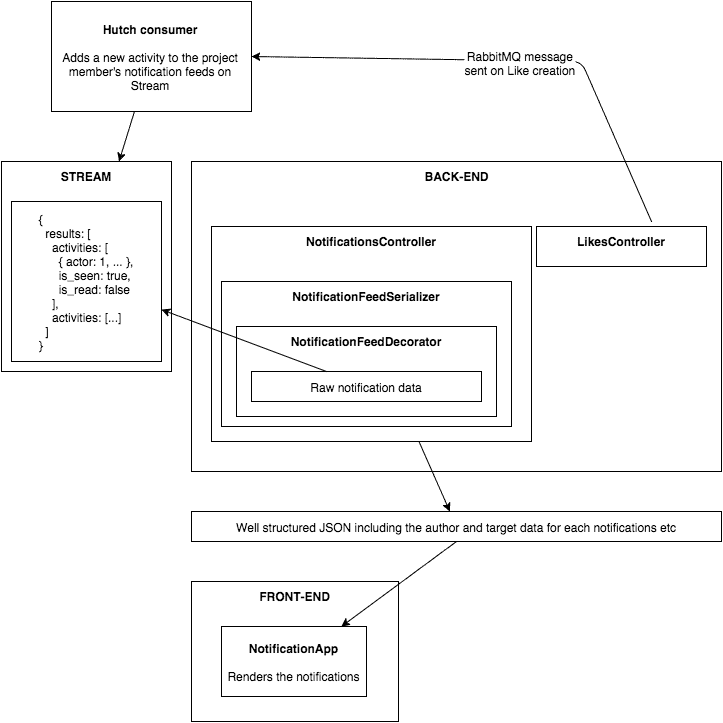 The notifications JSON returned by the server is generated with ActiveModel::Serializers, and as it turns out, they support caching out of the box. So, for the first time, I took advantage of this feature. The sad part is that the latest versions of this gem improves the caching feature quite a bit, so we'll have to think about upgrading (even though the new version is not backward compatible:( ). It doesn't look like much, but it really shows the basics of the notification feed. A good amount is still needed.